WPS Office is an office suite that allows professionals, educational institutions, and businesses to effectively handle their office tasks. It is a subsidiary of Kingsoft Corp. and has been popularly used as an alternative to Microsoft Office. It is a cross-platform suite that contains light and efficient applications that run on Windows and Linux computers as well as on Android and iOS mobile devices. Users can utilize the product to meet their word processing needs such as creating or modifying word documents, producing spreadsheets, converting PDF files into editable formats and retrieving accidentally deleted files. It comes in different editions including a free version that provides basic tools to users. WPS Office contains a rich editing software called Writer that can create and edit texts, images, custom charts, tables, and other objects to produce amazing documents. 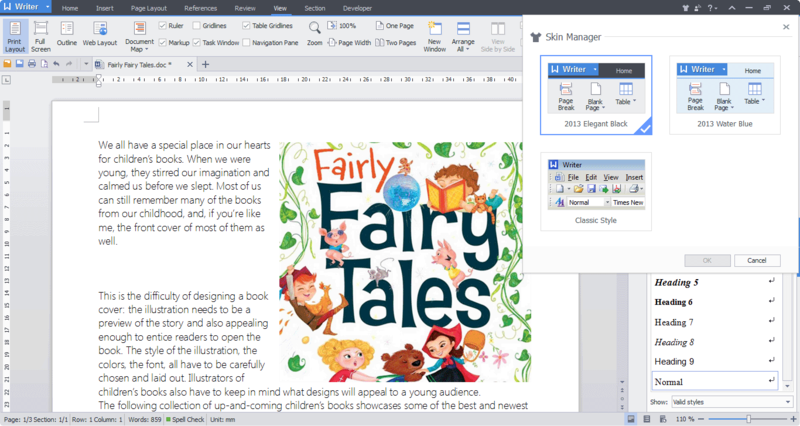 Writer is also fully compatible with Microsoft Word, therefore, MS Word documents can be directly opened, edited, and saved within the application. It also provides users with a tabbed view that is helpful in editing multiple documents at the same time. This allows users to view and manage multiple documents from just one window or screen. Writer has the capability of converting documents into PDF files, which is a great way of saving the file into smaller sizes for easy sharing. This would also ensure the security of files when accessed. On the other hand, WPS Office also features a high-quality PDF converter which can quickly convert PDF files to DOC and DOCX format files. This easy-to-use PDF converter is also accurate enough to ensure that the layouts, fonts, and styles are intact after conversion. Word processor has a drag-and-drop feature that allows users to adjust indentation, line spacing, and paragraph spacing naturally and conveniently. It allows for easy editing of document layout with just the use of the mouse. WPS Office has a presentation tool that allows users to create stunning presentations using pre-made templates that are provided by the system. Users can utilize formatting tools and insert various forms of multimedia such as images and videos to further enhance their presentation. WPS Office Business Edition gives the users’ team members the capability to add comments and share their ideas about the presentation as it is being made and shown to them. WPS is available in iOS and Android devices as well which means that users can create and edit their documents anywhere. They can also access their documents that are stored in the cloud from their mobile devices. Included in the WPS office suite is the WPS Data Recovery Master that allows the users to recover their encrypted files and documents. Whether it was accidentally deleted or was removed due to hardware malfunction, this solution can bring the file back. It can implement deep data recovery as well via in-depth scans.